WORCESTER, Mass. 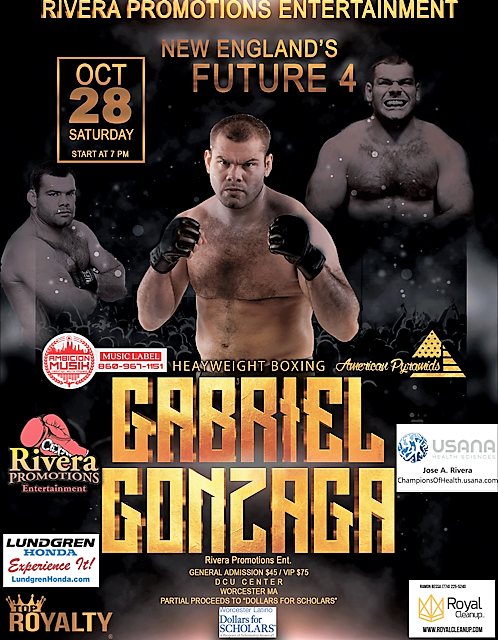 (September 13, 2017) - Former UFC heavyweight title challenger Gabriel "Napao" Gonzaga will make his professional boxing debut Saturday night, October 26, on the "New England's Future 4" card, promoted by Rivera Promotions Entertainment (RPE), at the DCU Center (Exhibition Hall) in Worcester, Massachusetts. "New England's Future 4" (NEF4) is presented by Rivera Promotions Entertainment (RPE), which is owned and operated by retired three-time, two division world champion Jose Antonio Rivera and his son, Anthonee (A.J.) Rivera. Former WBU Americans and IBU North American cruiserweight champion Vinnie "American Nightmare" Carita (16-1-1, 15 KOs), rated No. 6 by the North American Boxing Organization (NABO), headlines against an opponent to be determined in the eight-round main event. "RPE is excited to have an athlete of Gonzaga's caliber making his pro debut on our NEF4 boxing event," promoter Jose Antonio Rivera said. "We are happy that boxers and MMA athletes trust us in terms of what we are trying to do to help them build their careers." The 38-year-old Gonzaga teaches Brazilian Ju-Jitsu (BJJ) in Worcester and lives nearby in Ludlow. Now retired from mixed-martial-arts competition (17-11-0, 7 KOs, 9 SUBs, 1 DEC), the 6' 2", 260-pound Gonzaga holds 4th degree black belt in BJJ. The highlight of his MMA career was at the 2007 UFC 70 held in Manchester, United Kingdom, in which he knocked out K-1, Pride and Rizen champion Mirko Cro Copwith a head kick in the opening round, positioning Gonzaga for his unsuccessful challenge of UFC Heavyweight Champion Randy Couture in his next fight. "When I first saw Gabriel sparring," Gonzaga's trainer Rocky Gonzalez said, "I knew he had potential to beat a lot of heavyweights around. He had a lot going on at that time and he was still under contract with the UFC. Now, it's a great opportunity for him."